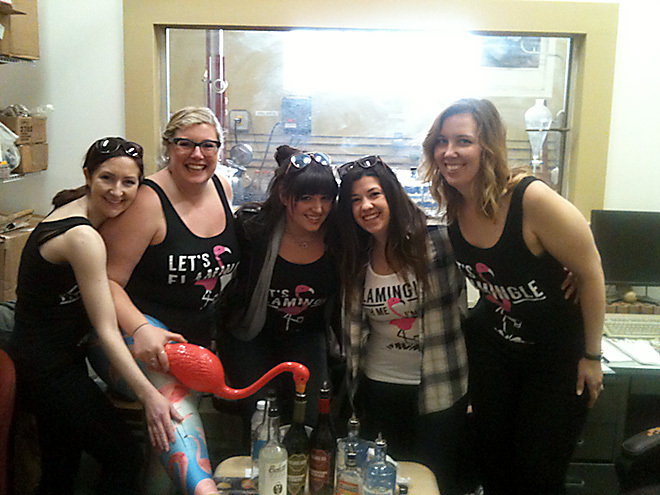 We’ve had a few bachelor parties visit the distillery, and it’s generally a fine & rowdy time. This past weekend, we had our first bachelorette party visit, and they went above and beyond some of the previous efforts. Traveling with their own Flamingo mascot, and matching “Let’s Flamingle” t-shirts, they traveled all the way from Canada (seriously!) to partake in the pleasures of New Orleans, before sending their favorite Emergency Room doctor (2nd from right) off to wedded bliss. Lindsey, (2nd from left) the intrepid organizer of the expedition, shows off their mascot attempting to drink absinthe straight from the bottle, a practice we recommend against! Fortunately, they learned all about absinthe and the proper ways to drink it. This entry was posted in Atelier Vie, Toulouse Green. Bookmark the permalink.